LEADSINGER model LS-3222 is a Wireless high-fidelity remote Duet Microphone that works with any 3000 series LEADSINGERKaraoke Microphones â€“ including LS-3000 and LS-3700 (MAIN MIC). User simply plugs the Sub-Mic Receiving Pack (included) into the back of the MAIN MIC, press MODE + 6 (or 2 on some versions) on MAIN MIC, insert 2 AA batteries into LS-3222, and press power on. 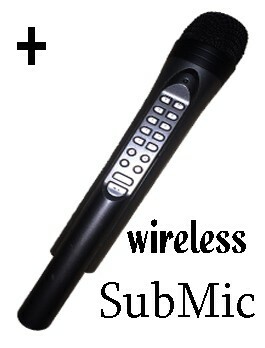 As well as the ability to sing simultaneously with MAIN MIC's user, LS-3222 user is able to control almost all functions of the MAIN MIC wirelessly. LS-3222 features an automatic shut-off function which turns itself off if sound is not detected for 3 consecutive minutes. User can simply press power on in order to use it again during any time. RANGE: Greater than 100 feet. DIMENSIONS: 9.5â€ x 1.5â€ x 1.5â€ (UNIT), 12.5â€ x 9â€ x 2â€ (BLISTER PACK). To save on shipping costs some items may not come in retail packaging. This microphone requires an LS-3700 to function. This is not a main microphone. It is for duet singing only. it does not accept musikartridges. Info: This unit may not be packaged in a blister pack.